Work Hard, Play Hard | Are You the Gatekeeper? It’s official. Marathon training has begun. FULL marathon training. Five months from Monday is the Disney Marathon in Orlando, FL. I had a mild panic attack the other day realizing that it’s less than half a year away. Then I had another teeny one yesterday after I tried running on a treadmill and thought I was going to die. I have a lot of work to do, a lot of ground to make up from my two months off. I am bracing myself for the constant soreness, for ALWAYS having at least one part of my body hurting. Right now it’s my traps and my inner thighs. Tomorrow will probably be my hamstrings and abs. There are just over two months until my two half marathons in three weekends jaunt. There are miles upon miles that I am getting ready to run. There is the knowledge that I’m going to have my footsies covered in blisters in no time. There’s the fear, the apprehension. What if I can’t do this? There will be the routine that I sidle into, between time in the gym and time out on the open road. There will be sweat and pain and roadblocks, both mental and physical, and then the bull-headed attempts to refocus my motivation, which I’m sure will wander from time to time. There’s a lot of work ahead of me. Phew. Good luck with that. 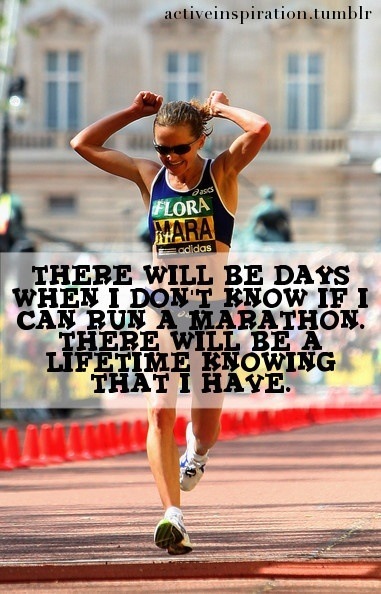 Are you running that marathon with someone? How did you choose FL? I'm sure you'll rock it!